My dad, Lynn, and I met with cuz Bill and his wife Marian on 3/19 & 3/20 to make some headway on the Marsalis Cemetery project in Amite County. We spent about 6 hours in all, mainly chopping brush and felling trees. We also brought herbicide to spray on the stumps to prevent re-sprouting, and sprayed Round Up everywhere we could see weeds sprouting. We all got a good workout hauling and piling brush. We also opened up a wide pathway to the cemetery. It begins just past the abandoned mobile home in the woods. 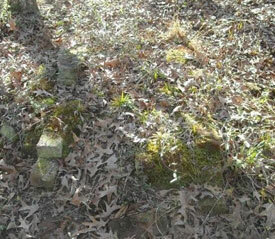 Once the brush was removed, Bill and Marian located a few more headstones and footstones which were buried in leaf litter. We’ll post “after” photos as soon as possible.
. Most of the sons were born in Georgia in the very early 1800s and the rest in Amite County Mississippi. The sons’ names were Ephraim, William P., Patterson, Thomas, James, and John. It is KNOWN that Thomas L. was a son of Patterson and his SECOND wife Martha Terrell. This entry was posted in Blogs on March 4, 2009 by admin.